By Paola K Amaras with Paul T. Kraly. “Art tells universally relevant stories precisely because they are the embodiment and expression of the human experience.” — Dr. William Griswold, Director of the Cleveland Museum of Art. Embarking on its second century, after a spectacular year of centennial celebrations in 2016, the Cleveland Museum of Art, or CMA as everyone around here knows it, is thriving. 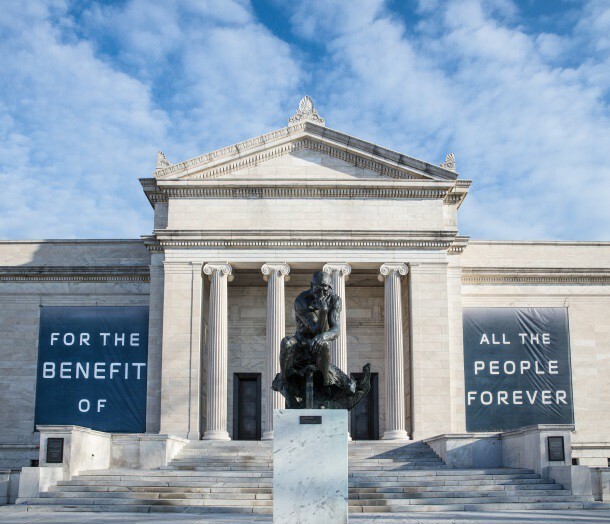 This first article about the museum’s mission and initiatives concentrates on how this remarkable institution looms large in both Cleveland and the nation. Dr. William Griswold, the museum’s tenth director, discussed CMA’s present and future. This is what it says right on the banner in front of the 1916 building, behind one of the final August Rodin-supervised casts of The Thinker. Acquired in 1917, just after the museum opened to the public, the sculpture stood unharmed until 1970 when, during violent political statements against anything that seemed ‘establishment’, dynamite placed on the pedestal permanently damaged the base and legs of the sculpture. Instead of repairing it, the museum chose to leave the casting as it was, as a reflection of the political unrest and upheaval of the times. But like CMA, The Thinker is still standing, a testament to the enduring power of art . As reported in the Cleveland Plain Dealer (12/25/1892), Jeptha Wade deeded the land, “not as a gift for the City of Cleveland, but as a Christmas present to the people of Cleveland — an offering which will forever be a thing of beauty…” Wade’s gift of 3 3/4ths acres and the consolidation of a number of trusts and bequests under one aegis was the inception of the museum as it stands today. It is still one of the few museums of its size and scope that has free general admission to the public. Everyone is welcome to tour both the old and new galleries and exhibits of the museum, stay for a concert, film, or lecture, or partake in a wild, educational MIX at CMA party on the first Friday of every month. The museum’s renovation and re-purposing of its existing footprint was completed to ensure there was a sense of community excitement as the new structure unfolded. Now completed, an old, rarely-used courtyard has become a soaring, lighted atrium that hosts monthly MIX parties revolving around a theme based on the museum’s extensive collections, and is a popular site for weddings, along with the annual Solstice celebrations and other community-focused events. Provenance, an award-winning 76-seat restaurant replaced a tired cafeteria, and sliding glass doorways and a mezzanine lead to galleries and special exhibit spaces where visitors can experience the magic and beauty of art. The gift shop located near the entrance caters to all ages and income levels and always has something for everyone. Dr. Griswold and his staff — about 400 of the most passionate people around — are implementing a number of initiatives to expand the reach of the museum: Art, Place, Program and People. CMA boasts an amazing collection and is distinguished simultaneously as boutique as well as world class. Its Asian collection is considered one of the finest in the world, and there are other exceptional works and exhibits that are “essential to ensure broad and diverse physical, intellectual, and emotional experiences to all visitors” according to Dr. Griswold. CMA is also about scope and variety, from Apollo Saurokontos, an original by Praxitales, to a special exhibit by Jean-Michel Basquiat, a Brooklyn-born artist whose numerous notebooks display poetry, wordplay, sketches, and personal observations ranging from street life and popular culture to themes of race, class, and world history. Installation photo of the Cleveland Museum of Art’s Armor Court. Photo by David Brichford, courtesy of the Cleveland Museum of Art. CMA has always had a strong focus on local talents, and even though the well-respected May Show, a juried art show of local artists that ran from 1919–1993, is no longer one of the annual highlights of the museum, Dr. Griswold and his staff are reaching out to local artists to exhibit in some of the museum’s annexes, with buildings like The Transformer Station. Paid exhibits, such as Basquiat’s Notebooks, the upcoming Alex Katz in the 1950’s, and last year’s Pharaoh, help underwrite the cost of the free galleries and bring in locals to see some of the great art of the world. Although many miss the May Show, (as I write this, I am looking at a lithograph my mother purchased years ago from this annual event) the opportunities for local artists to embrace the museum and its exhibits fulfill the mission of making art accessible and meaningful to everyone.